Buy edible dessert decoration sprays in wholesale! Easy to use, quick-drying and affordable, these sprays can be used to a large quantity of desserts in one go. 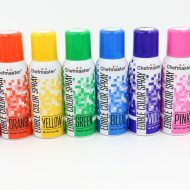 Ideal for decoration pieces, cakes and fruit-based pastries, these sprays are also not water-based so there is no color bleeding. We only offer quality spray products for dessert decoration.